Added link for playlist to "Decktechs & Interview" + added lists to "Additional lists"
Video Coverage of the final match will follow. 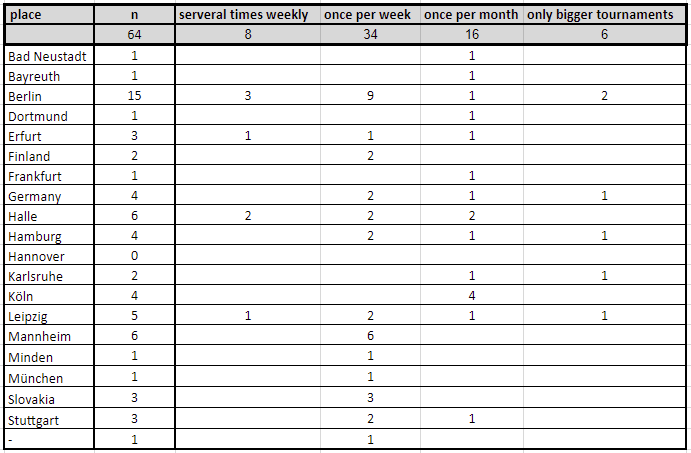 If you are interested in a specific list, leave me a comment. Valid during January 1st, 2019 0:00 CET until March 30nd, 2019 24:00 CET. 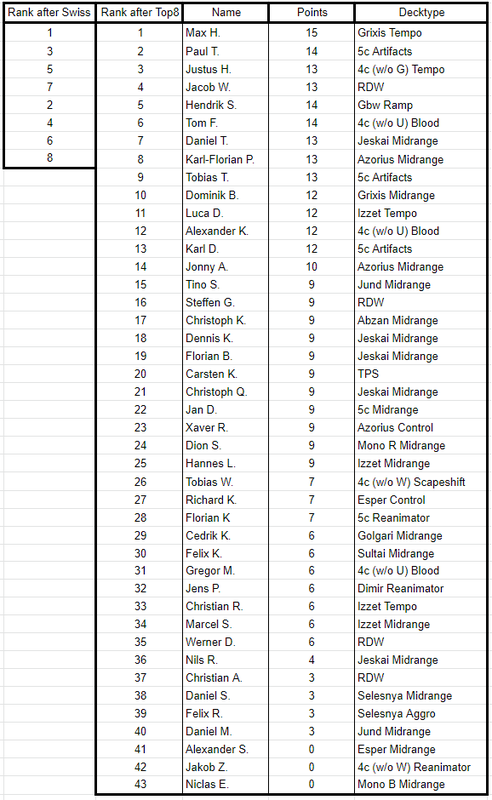 Cards, apart from the striked ones, on the following list will be closely observed and are potential candidates for a banning on April 15th, 2019. Cards, apart from the striked ones, from the following list are still banned but will be under testing for a potential unbanning on April 15th, 2019. Imperial Seal remained banned over ten years, until it was reintroduced to the format in October 2017. At the same time, we banned Mystical Tutor. Although we've had some concerns Combo could be too oppressive giving it Imperial Seal as another cheap tutor-spell this worries seemed unrighteous. 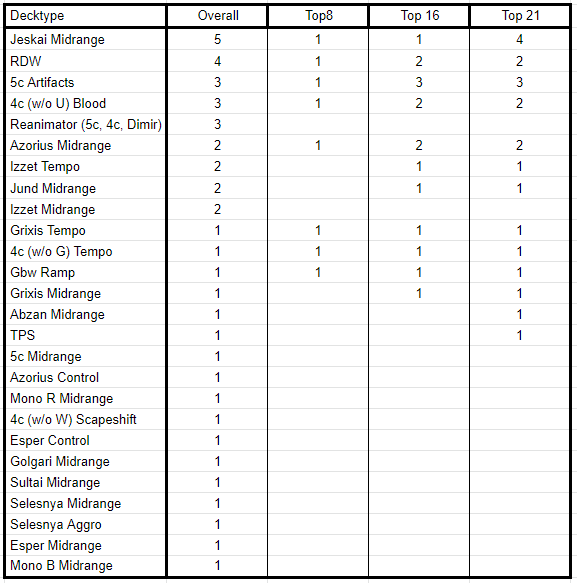 At least the recent tournament results haven't pushed that concern as the meta seems almost balanced and the top 8 was filled with diverse decks of various archetypes. Furthermore it became clearer that there isn't currently any need of some drastic changes so we decided to concentrate on the other tutors on watchlist as candidates for a ban and cut Imperial Seal from this list as its card loss, sorcery speed and life-loss are often a high price for its versatility. Oath of Druids has been one of the longest watch-list entries, it has been observed since April 2013. It has been used in pure combo decks either as a perfect combo enabler, filling your graveyard with all the cards to go off, or as the tool in more "fair" decks to unleash the real archfiends of Magic, Emrakul or Griselbrand. But with every set printed the list of versatile answers for both of these threats are offered, and so it has become hard for an oath-player to assemble the combo. 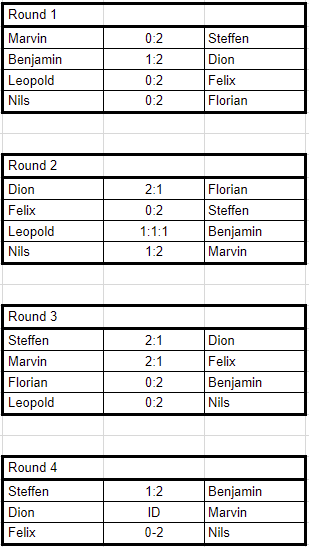 Although there are still some busted starts from time to time, the deck itself doesn't seem that consistent that it dominates. The card is also used as a side-plan for some Academy- and especially Reanimator-builds, but pure Oath-decks have become a rare archetype in top spots of the field recently. Birthing Pod was added to watchlist in October 2011, pretty quickly after the card was released. Shortly, in April 2012, the card was banned. Five years later, in July 2017, Birthing Pod was reintroduced back to watchlist, and since then, it has been an on and off candidate for unbanning. 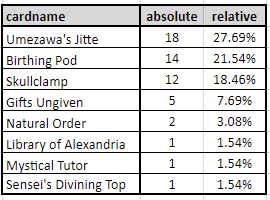 It became clearer, that this every-turn-repeatable tutor won't get enough unban votes on April so we decided to cut it from unban watchlist and concentrate on the three remaining candidates. 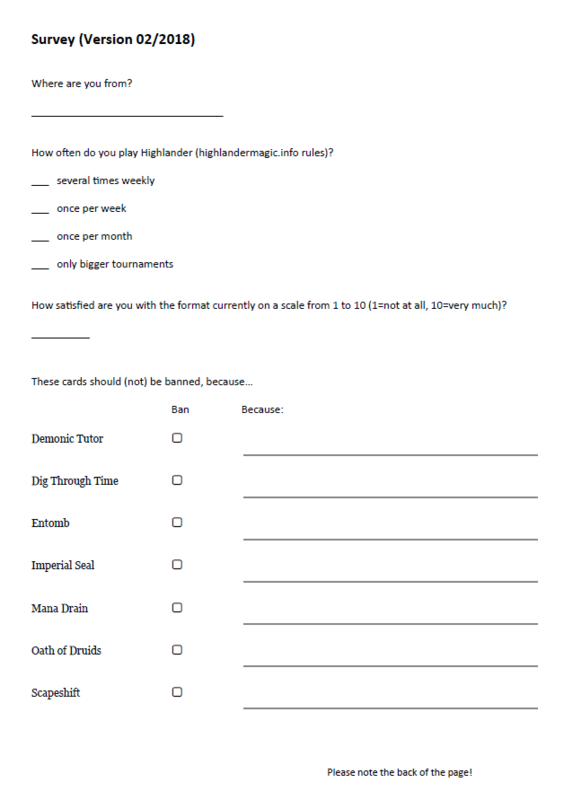 We encourage the community to give us more feedback, as it has been done in here: http://www.magicplayer.org/forum/index.php?topic=668.msg14635#msg14635. Council would like to give a big thank you for the feedback it has received so far! We had also some arguments against bannings/ unbannings of specific cards. 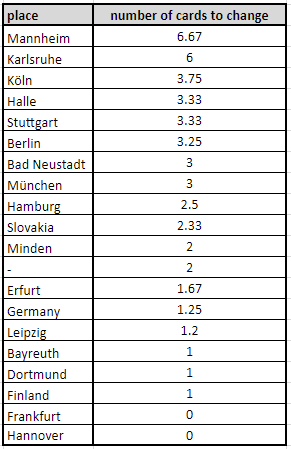 - decks are not winning tournaments -> why weaken? - Is Reanimator Tier 1? 11 participants did not write anything on the back page of the sheet. This can have different reasons like a. overlooked the back page, b. would simply not ban/ unban cards, which was written on the back page. Also: most of the participants, who did not filled out the back page, did barely filled out the front page, too. 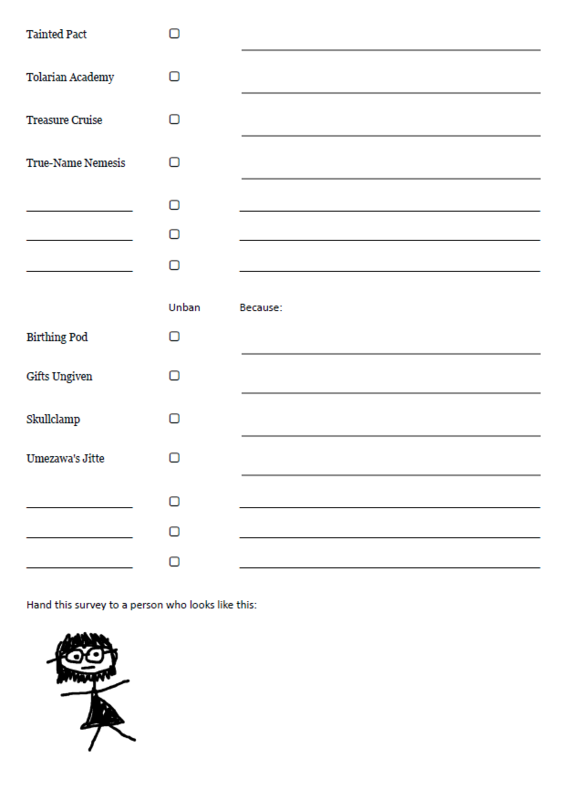 This survey was hand out at the Continental Cup in Halle, Germany, November 17th. We had 65 participants. 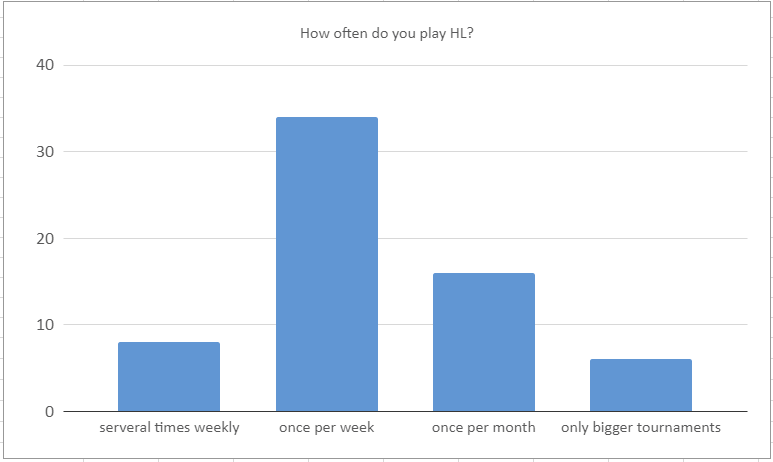 How often do you play Highlander (highlandermagic.info rules)? 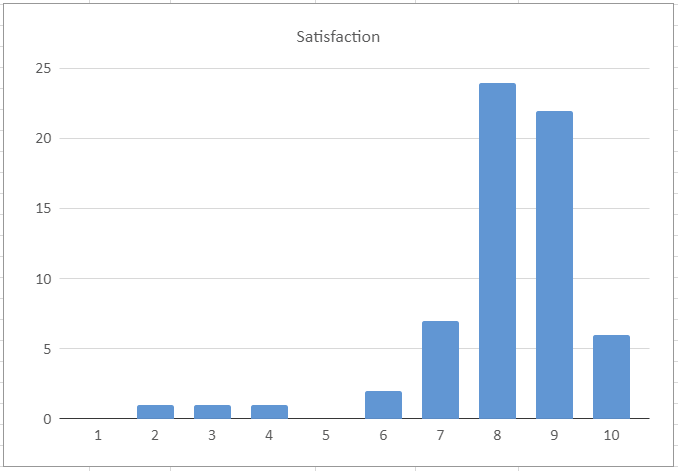 How satisfied are you with the format currently on a scale from 1 to 10 (1=not at all, 10=very much)? - Why is this even banned? 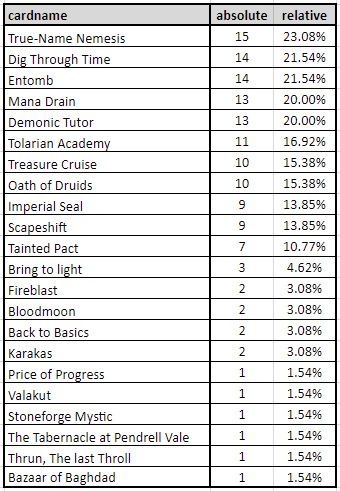 Leave me a comment if you are interested in another deck lists.